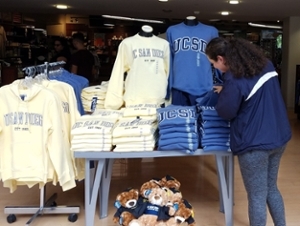 University Centers offers a variety of convenient retail and entertainment services for the UC San Diego community. Easy pick-up and returns at Price Center! On-site Customer Service and longer package holds available. Park in V (visitor) spaces, cost is $3.00 an hour. From Gilman Parking Structure, walk up Russell Lane to the end of the road. Turn left and follow road up to UCSD Bookstore. Signs will direct you to Amazon. If the UCSD Bookstore is closed keep walking to end of the building and turn right on Library Walk; turn right again, and follow the steps down to Price Center Plaza. Amazon will be on your right. Innovative graphic design services and solutions for UC San Diego students, faculty and staff. Find spirit gear, gifts, dorm accessories, and of course your textbooks, medical books and office supplies. Pick up tickets for campus and Ticketmaster events, plus get student discounts on area attractions and movies. Take care of all your banking needs at Chase's convenient location on campus; Level 1 Price Center East. Enjoy free play on classic video games and choose from a variety of vending snacks and drinks. Price Center, Level 2, near Library Walk. Prep yourself for success with Kaplan's LSAT, MCAT, GMAT, and GRE test prep classes. A general information desk, providing all resources and services student organizations need to reserve rooms, plan events, and more. Drop and claim lost and found items. Quality salon services conveniently located in the heart campus at Price Center—haircuts, color, waxing, facials, manicures, and pedicures. Call for an appointment. A well-stocked shop with everything you need to keep your rides safe and smooth. A cooperatively managed bookshop run by volunteers, serving as a community resource for students, faculty, and activists.